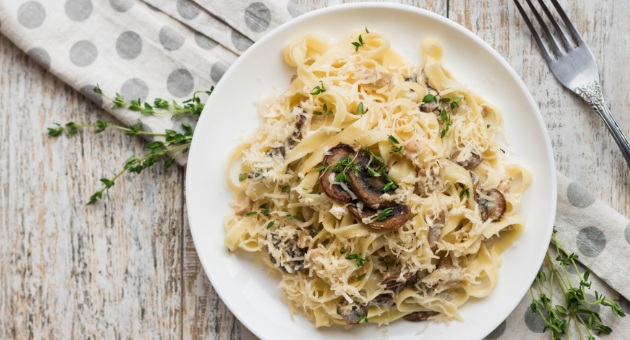 This Thyme mushroom pasta is one of my favourite vegetarian mid-week meals. It’s quick and easy to make and really tasty. You can make it with any kind of mushrooms, but I like a mix of shiitake, oyster and field or Swiss brown mushrooms. Fill a large pot with water and bring to the boil. In a wok or large pan, melt the butter over a low heat. Add the garlic, mushrooms and thyme and turn the heat up moderately high. Season with a good pinch of sea salt and black pepper. Stir the mushrooms continually until they start to soften and brown. Add the vinegar and stock. It should sizzle and reduce until there is just a little liquid in the bottom of the pan. Turn off the heat and stir through the creme fraiche. Add the pasta to the boiling water and cook according to the packet directions until al dente. Once it is cooked, strain and then add to the mushroom sauce. Turn on the heat and mix the pasta through the sauce to gently heat. Divide between four bowls and top with parsley and parmesan. Enjoy immediately. Make this dairy free and vegan by replacing the butter with extra virgin olive oil, the creme fraiche with cashew cream and the parmesan with nutritional yeast.